After six league games, there are reasons to be concerned and there are reasons to believe that we can grow into the campaign. This upcoming game against Oxford United in front of the Sky cameras is likely to present our sternest challenge yet and will provide a better indication of what we can expect from this side this season than from we’ve seen until now. The case for positivity has been that we’ve generally created enough chances to win each of our league games thus far – with the possible exception of the encounter with Blackpool. Tom Bayliss and Tony Andreu clearly have a lot to offer in a creative sense, Jonson Clarke-Harris has shown promising signs as an attacking focal point over the past two games, Luke Thomas is a dangerous option out wide, and there is still Conor Chaplin, Reise Allassani and Jodi Jones to be integrated into the side. Potentially, that’s an exciting attacking unit that also has strength in depth. The case for negativity is that we have conceded several soft goals already and have benefited at times from some poor finishing from our opponents not to have shipped more. That’s in addition to the fact that, for all of those promising signs going forward, we’ve mustered just one goal from open play and three in total in six games. Whether this game is an occasion for Mark Robins to deviate from the blueprint of playing as many of our more promising attacking players as possible in an attempt to shut up shop against an Oxford side featuring an array of more proven attacking talents will be the key feature of the team selection. It wouldn’t be surprising to see Abu Ogogo come into the side as part of a double defensive-midfield pivot in the hope that he and Doyle can protect the back four. If Mark Robins opts for that approach, there is a real burden on the front four to make the most of hopeful punts forward and make the correct decisions on the counter-attack. Bifurcating the team between defence and attack in such a way also potentially leaves us prone in wide areas if Oxford are able to double-up with their full-backs and create overloads. Even if Mark Robins looks to adopt a more proactive game-plan, there are still plenty of selection issues to consider due to the sheer number of attacking options available. The key one being whether one of Tony Andreu or Tom Bayliss is sacrificed in an attempt to bring the £500,000 man Conor Chaplin into the starting XI, which adds another forward to the mix but removes a level of creativity from the side. It was just a few weeks ago in the League Cup that we last traveled to Oxford United. It was a performance that already lives in infamy as one of our worst of the season as a Frankensteinian line-up ambled about a lot like a loose collection of limbs but without the presumed energy that a lightning bolt to the system would have delivered. Oxford won 2-0 and have since drawn Manchester City in the Third Round of the League Cup. Having started poorly themselves, Oxford are showing signs of moving up through the gears. They picked up their first league win of the season at the fifth attempt against Burton two weeks ago, the U’s then dominated away at Sunderland last week and were unlucky not to come away from the Stadium of Light with all three points. In James Henry and Ricky Holmes, Oxford have two experienced and proven creative talents to call upon. Both have recently been considered the best winger at this level of football, with Henry since being moved to a central role, while Holmes is perhaps the more eye-catching of the two with his industry and ability to glide with ease past defenders. If both are on top form, we stand little chance of keeping a clean sheet, no matter how well we play. 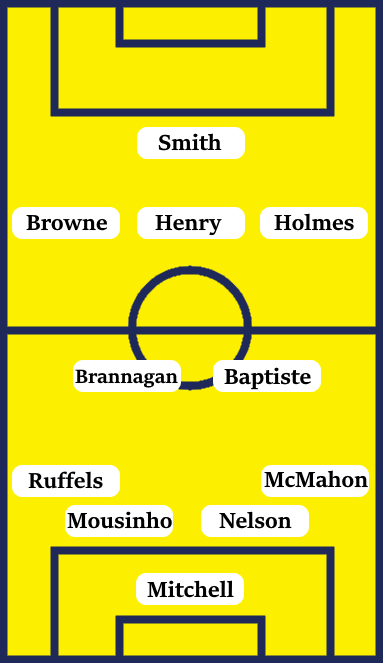 Oxford’s array of attacking-midfielders and wingers extends deeper with Marcus Browne, a West Ham loanee who offers a pacier option to Henry and Holmes, and Gavin Whyte, who scored a hatful last season in the Northern Irish league. With the likes of Jamie Mackie and Samir Carruthers in further reserve, this is a side packed with talent in the three positions behind the centre-forward in Karl Robinson’s trusted 4-2-3-1 system. Furthermore, in Cameron Brannagan and Shandon Baptiste, recently emerged from the club’s youth system, in central midfield, Oxford have found a duo capable of supplying creativity and industry, respectively, in those midfield roles behind that three. Given Karl Robinson’s possession-based approach, Oxford are likely to dominate large spells of this game in midfield. The two key problems for Oxford this season have been a lack of pace in defence and in the central striking position. There is individual quality in these areas, such as Curtis Nelson, John Mousinho and Tony McMahon at the back, and Jon Obika and Sam Smith up front, but they don’t seem to have quite figured out how to integrate themselves into Karl Robinson’s preferred style of play. There is a way in which we can win this game, drawing Oxford onto us before trying to exploit their lack of defensive pace. Not only does that plan rest on our defence holding strong and our attackers making the correct decisions on the counter-attack, but it could also hinge on whether Oxford’s array of attacking talent are in a clinical mood. With our opponents likely to be keen to make up for their spluttering start, along with the attention of the Sky cameras, it’s hard to see them not being switched-on for this contest. Unless Mark Robins can once again raise a Coventry City side at a key stage of the season, I can see this being a comfortable win for Oxford United, 3-1.